When Bill Leak delivered a typically engaging presentation in Sydney a decade ago on the remarkably talented Australian cartoonist Will Dyson, he went into raptures about the dazzling quality of Dyson’s art. In fact, as the tributes to Bill Leak have underlined, he had a great deal in common with Dyson. Not only were they renowned for trenchant cartoons of scintillating ferocity. Both were brilliant and versatile artists; both created words with flair as well as drawings; both published their writing in lively prose and sparkling speeches. As well, they had similar temperaments — even equivalent deaths. Dyson, born in Ballarat in 1880, struggled to find a congenial niche in Australia, but became a stunning overnight sensation in 1912 with cartoons of exceptional force and resource for the London Daily Herald. He complemented his art with incisive, witty captions, and admirers marvelled at the way his drawings could induce a smile and a wince simultaneously. Sound familiar? Greg Sheridan praised Bill Leak as the greatest cartoonist he has ‘ever seen operate in any newspaper’ because he ‘combined three astonishing technical skills’. The first was the sheer brilliance of his drawing ability as an artist; the second was his capacity to weave in multiple layers including irony and humour; the third was his ‘poet’s skill’ or ‘headline writer’s skill’ evident in his masterly captions. Sheridan could have been describing Dyson, who also managed to combine all three of these rare attributes. Dyson was hailed by luminaries such as Shaw, Wells and Chesterton as the finest cartoonist Britain had seen for decades. He flourished as an after-dinner speaker and — like Bill Leak — delivered stirring speeches on contemporary political controversies. An Australian journalist working in England described Dyson as the most famous Australian in the world. Tributes to Bill Leak have saluted his courage in continuing with incisive cartoons on controversial themes despite death threats that security agencies warned him were serious. Dyson was equally uninhibited about offending the powerful and the vengeful: during the 1930s his belittling, scathing cartoons about Hitler and Mussolini were resented by his targets — Goebbels reputedly kept a file of them. Moreover, Dyson had felt impelled to go to the Western Front in 1916 to provide an illustrated record of the Australians’ contribution in the Great War that had become so crucial in the nation’s narrative. 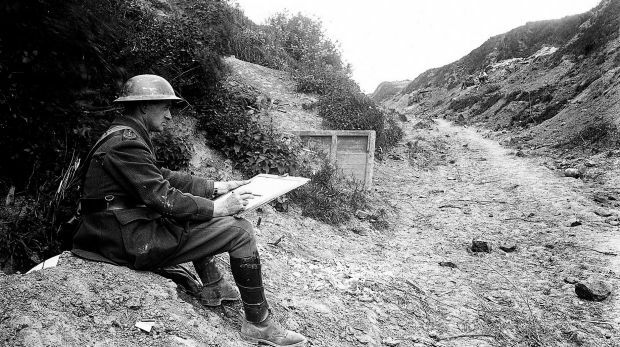 As Australia’s first official war artist, he was wounded twice — though a non-combatant — while bravely creating hundreds of drawings of profound empathy and sympathy. Dyson also wrote about Australian soldiers, in prose and verse, as poignantly as he drew them. The versatility of this pair of creative maestros was exceptional. Not only did Leak, like Dyson, write and speak with arresting wit. Leak, like Dyson, has had oil paintings on prominent display at our national cultural institutions. Both were larger than life personalities, mercurial and convivial; they were entertaining raconteurs with rapier-like repartee and a propensity for earthy language. Many tributes to Leak have highlighted his resistance to political correctness. Dyson was also frustrated by Australian cultural shortcomings. Having travelled back to his homeland in 1925, he interrupted a playwright engaged in erudite conversation: ‘If you say anything intelligent in this place, I’ll tell on yer!’ Dyson left Australia again in 1930, never to return. Even as experienced cartoonists, Dyson and Leak both found it a stressful daily challenge to come up with a penetrating idea and then create a drawing. Dyson used to have a batch of newspapers and cigarettes delivered each morning, and there was an air of tension in his household until he had devised and created his cartoon for the next day’s paper. That this was for Bill Leak a similarly ‘tortured’ process ‘fuelled by coffee and cigarettes’ has been confirmed by his friends Warren Brown and Fred Pawle. The lives of Bill Leak and Will Dyson ended in similarly curtailed fashion. Leak died of a presumed heart attack, aged 61. Dyson died of a presumed heart attack, aged 57. Leak revered Dyson. If Dyson had known Leak’s work, the profound admiration would have been mutual. Australia was fortunate indeed to have produced them. * Historian and biographer Ross McMullin’s books include the award-winning Pompey Elliott and Farewell, Dear People: Biographies of Australia’s Lost Generation. His biography Will Dyson: Australia’s Radical Genius has been reissued in paperback. 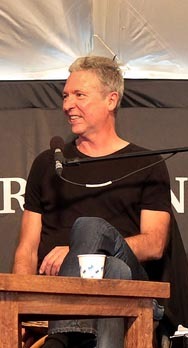 He and Bill Leak did a combined presentation on Dyson at the Sydney Writers Festival in 2006.